Where tectonic plates slide past each other, in a process called transcurrent tectonics, the landscape is dominated by long linear valleys and ridges. The classic example is the San Andreas Fault; for more on the San Andreas Fault, take a look at this article from geology.com on The San Andreas Fault. 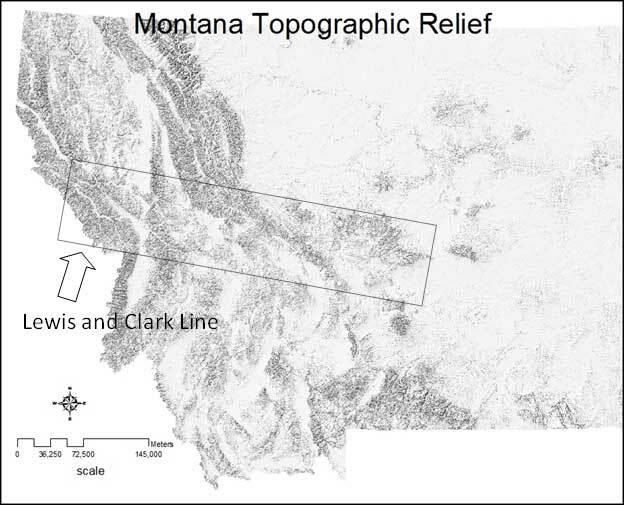 A Montana example is what is called the Lewis and Clark Line that runs along the Clark Fork River valley from Garrison to Missoula as seen below in Figure 3.4. Figure 3.4: The Lewis and Clark line along the Clark Fork River valley is an example of a landscape where tectonic plates slide past one other. The resulting landscape is dominated by long linear valleys and ridges.